Smart cards offer more security and confidentiality than any other financial or transaction card on the market. They use encryption and authentication technology which is more secure than previous methods associated with payment cards. Another advantage to having a smart card is their use the banking industry. These cards give the holder the freedom to carry large sums of money stolen. They are also safe because the cards can be easily replaced, and the person would have to know the pin number to access its store value. Smart cards Offer a variety of benefits to merchants, financial institutions, and other card issuers such as faster transaction, increased sales, reduced costs, easier book-keeping, and fewer losses. Making a payment with a smart card saves a lot of time because its chip contains details about the owner in a non-encrypted form and the user doesn’t have to explicitly provide details for verification. They can provide complete identification in certain industries. 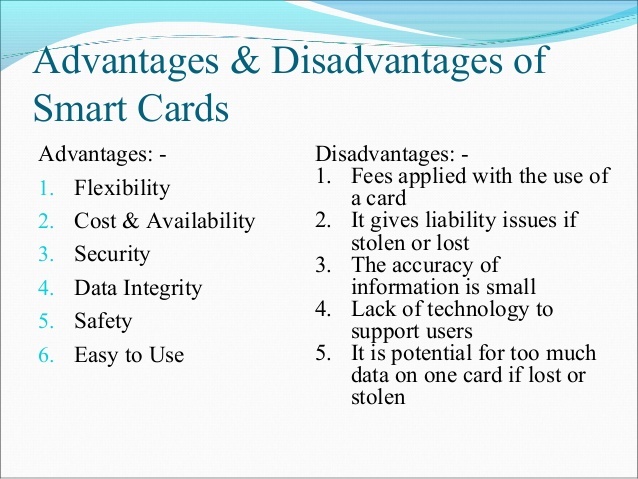 There are numerous benefits of using smart cards for identification. For example, a driver’s license that has been created using smart card technology can give the police the ability to quickly identify someone who’s been stopped for speeding or reckless driving. Smart cards are a safe place to store sensitive information such as keys, passwords or personal information. 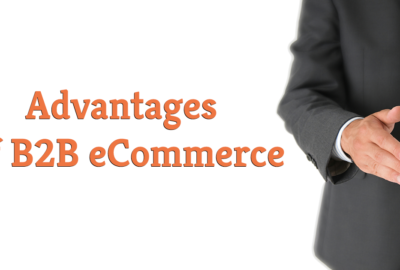 As compared to debit and credit cards, smart cards are less expensive and provide faster transaction processing. Other benefits of using smart cards for identification can be used by governments to prevent benefits and social welfare fraud to ensure the right person is receiving the welfare benefit. Smart cards are small, lightweight and can be easily lost if the person is irresponsible. Since smart cards have multiple uses, the loss may be much more inconvenient. If you lose a card that doubles as a debit card, bus pass and key to the office, you would be severely inconvenienced for a number of days. Another drawback of using smart cards is their level of security. They are more secure than swipe cards. However, they are not as secure as some in the general public would believe. This creates a false sense of security and someone might not be as diligent as protecting their card and the details it holds. If used as a payment card, not every store or restaurant will have the hardware necessary to use these cards. One of the reasons for this is since technology is more secure, it is also more expensive to produce and use. Therefore, some stores may charge a basic minimum fee for using smart cards for payment, rather than cash. Smart cards are vulnerable to hardware hacking, which means that data stored in the card can be altered or corrupted. For criminals seeking a new identity, they are like gold, based on the amount of information it can contain on an individual. 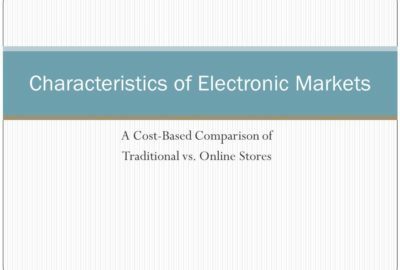 What do you mean by Electronic Markets?